Health care professionals (HCPs) should understand the clinical implications of depression and antidepressant discontinuation syndrome. Furthermore, patients should be educated about the benefits and risks associated with antidepressant medications, including possible discontinuation symptoms. By taking preventive steps, HCPs can help reduce the occurrence and severity of discontinuation symptoms while improving the patient experience. • Sensory symptoms: paresthesia or shocklike sensations sometimes described as "brain zaps" or "brain shivers." These also may include numbness and palinopsia (visual trails). Some describe a rushing noise in the head. • Disequilibrium or motor effect symptoms: dizziness, light-headedness, vertigo or feeling faint, restless legs, and gait instability. • General somatic symptoms: often compared with a flulike syndrome. This includes lethargy, headache, tremor, sweating, anorexia, and difficulty tolerating hot weather. • Affective symptoms: irritability, anxiety, low mood and tearfulness, possible suicidal thoughts, and visual hallucinations. • Gastrointestinal symptoms: nausea, vomiting, cramps, and diarrhea. • Sleep disturbances: insomnia, nightmares, and excessive dreaming. Antidepressants treat depression by increasing levels of one or more neurotransmitters in the brain, most notably serotonin, norepinephrine, and dopamine. Over time, neurons in the brain eventually adapt to increased levels of neurotransmitters created with antidepressant use. When an antidepressant is abruptly withdrawn, there's a significant drop in the level of neurotransmitters, resulting in antidepressant discontinuation symptoms. 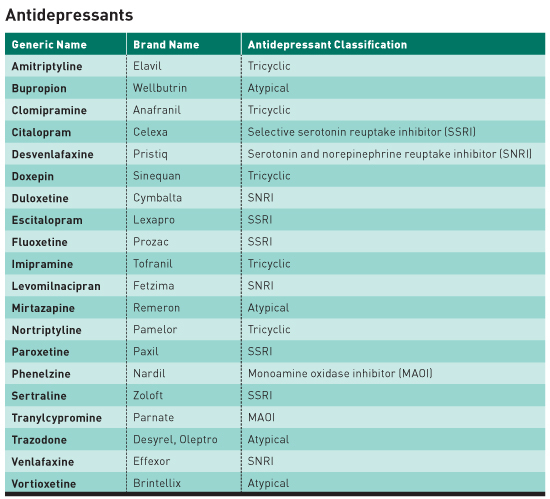 All classes of antidepressants (see table) can cause discontinuation symptoms with abrupt discontinuation. • Selective serotonin reuptake inhibitors (SSRIs) primarily block the reuptake of serotonin. Common SSRIs include sertraline (Zoloft), escitalopram (Lexapro), and paroxetine (Paxil). • Serotonin and norepinephrine reuptake inhibitors (SNRIs) block the reuptake of serotonin and norepinephrine and include venlafaxine (Effexor) and duloxetine (Cymbalta). • Tricyclic antidepressants (TCAs) such as amitriptyline and nortriptyline primarily inhibit the reuptake of norepinephrine and, to a lesser degree, serotonin. TCAs also have anticholinergic properties. • Monoamine oxidase inhibitors (MAOIs) block the activity of monoamine oxidase, an enzyme involved in the breakdown of norepinephrine, serotonin, and dopamine. • Atypical antidepressants do not fall into one of these classes and have different mechanisms of action but affect norepinephrine, serotonin, and dopamine. Discontinuation symptoms are similar among all classes of antidepressants; however, Parkinson's type symptoms and profound problems with balance appear to be especially prominent with tricyclic antidepressant discontinuation4 and are consistent with cholinergic rebound. HCPs should provide objective information to patients for any medication prescribed to them, including antidepressants. Patients should be included in the health care decision-making process. Discussing the potential side effects and antidepressant discontinuation syndrome should be part of that process along with providing information about the risks associated with depression itself. The link between depression and many chronic diseases is bidirectional. 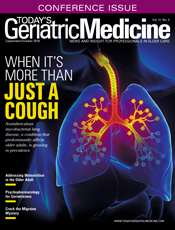 For example, preexisting depression is a predictor of future atherosclerotic coronary artery disease, cerebrovascular disease, diabetes, and osteoporosis, and, conversely, having a significant physical illness predicts higher prevalence of major depression compared with individuals without the physical illness. Depression can lead to worse outcomes in patients with heart disease (eg, coronary artery disease, congestive heart failure), including increased risk of reinfarction following MI and up to a threefold increase in all-cause mortality. Taper antidepressants to manage discontinuation symptoms is more an art than a science. Tapering an antidepressant dose to discontinuation may not be necessary for patients taking an antidepressant for fewer than five to six weeks or if the antidepressant is ordered at a low dose.2 However, for most other patients, abruptly stopping an antidepressant should be avoided whenever clinically possible. — Mark D. Coggins, PharmD, BCGP, FASCP, is vice president pharmacy services and medication management for skilled nursing centers operated by Diversicare in 10 states and is a past director on the board of the American Society of Consultant Pharmacists. He was nationally recognized by the Commission for Certification in Geriatric Pharmacy with the 2010 Excellence in Geriatric Pharmacy Practice Award. 1. Zajecka J, Tracy KA, Mitchell S. Discontinuation symptoms after treatment with serotonin reuptake inhibitors: a literature review. J Clin Psychiatry.1997;58(7):291-297. 2. Haddad P, Anderson I. Recognizing and managing antidepressant discontinuation symptoms. Adv Psychiatr Treat. 2007;13(6):447-457. 3. Schweitzer I, Maguire K. Stopping antidepressants. Aust Prescr. 2001;24(1):13-15. 4. Garner EM, Kelly MW, Thompson DF. Tricyclic antidepressant withdrawal syndrome. Ann Pharmacother. 1993;27(9):1068-1072. 5. Curtin F, Berney P, Kaufmann C. Moclobemide discontinuation syndrome predominantly presenting with influenza-like symptoms. J Psychopharmacol. 2002;16(3):271-272. 6. Cohen A; World Health Organization, Regional Office for Europe. Addressing comorbidity between mental disorders and major noncommunicable diseases: background technical report to support implementation of the WHO European Mental Health Action Plan 2013–2020 and the WHO European Action Plan for the Prevention and Control of Noncommunicable Diseases 2016–2025. http://www.euro.who.int/__data/assets/pdf_file/0009/342297/Comorbidity-report_E-web.pdf. Published 2017. 7. van Geffen EC, Hugtenburg JG, Heerdink ER, van Hulten RP, Egberts AC. Discontinuation symptoms in users of selective serotonin reuptake inhibitors in clinical practice: tapering versus abrupt discontinuation. Eur J Clin Pharmacol. 2005;61(4):303-307. 8. Zarowitz BJ. Antidepressant tapering: avoiding adverse consequences of gradual dose reduction. Geriatr Nurs. 2007;28(2):75-79. 9. Tint A, Haddad PM, Anderson IM. The effect of rate of antidepressant tapering on the incidence of discontinuation symptoms: a randomised study. J Psychopharmacol. 2008;22(3):330-332.